Cristina Sutter - Contact • Sport Dietitian • Vancouver B.C. Cristina Sutter will tell you how to eat to get the results you want. Cristina makes eating right a simple, fun and rewarding journey. "She was instrumental in setting up our nutrition information for our off-season manual. Great results. An expert in her field." "Cristina was creative in modifying performance nutrition strategies (for our athletes') daily training environment and competition." "Cristina does an exceptional job of providing information on how to fuel the body to enhance recovery and maximize performance." “You have a wonderful demeanor with kids - a true teacher. Miranda was very pleased with the consultation (as was Mom)." “I just weighed myself this morning and I am down 15lbs... it has been an amazing transformation for me." Please feel free to use the form below to get in contact with Cristina for any questions you may have, or to schedule your next individual or group consultation or writing project. In What are you interested? 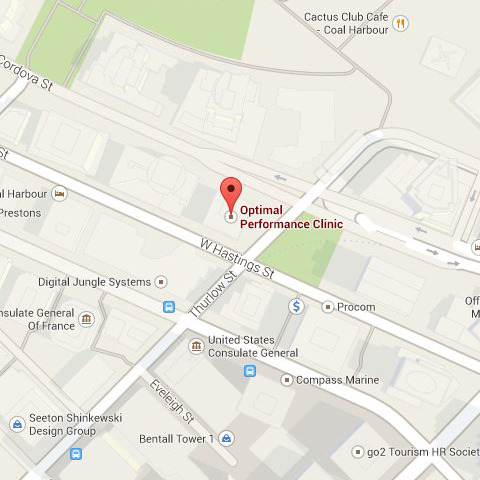 Cristina is conveniently located downtown at Optimal Performance Clinic. Cristina offers presentations throughout the lower mainland and BC. Suite 1250 - 1111 W.Hastings St.